I swear, I am not obsessed with apples and apple pie recipes! ..however I got Canadian Living - Everyday Favourites cookbook from the library and this was the first recipe that caught my eye. 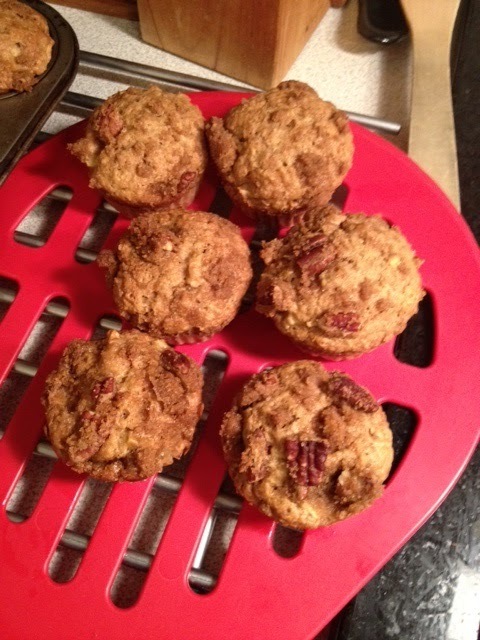 I love muffins with a topping, but had never attempted to make some myself. This recipe is quick and simple! Be warned though, it may drain your supply of brown sugar!! I think they turned out well! The apple makes them really moist. The Recipe said it makes 16 muffins but I had enough batter to make 18. - Topping: In bowl, stir together brown sugar, pecans, flour and cinnamon; drizzle with butter, tossing with for. Set aside. - Spoon into prepared cups; sprinkle with topping. Bake in centre of 375F oven until tops are firm to the touch, about 25 minutes. Let cool in pan for 2 minutes. 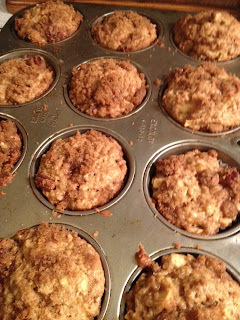 Run metal spatula around muffins to loosen, transfer to rack and let cool.